Caspar David Friedrich Trail - Caspar David Friedrich | Since 1774. In Greifswald. The Caspar David Friedrich Trail guides the visitor on a journey of discovery through the city of Greifswald and its immediate surroundings to explore places that were important to Friedrich’s life and work. Pausing at fifteen stops, the visitor can track down nearly authentic motifs of Friedrich’s works, experience the characteristic Friedrich atmosphere and share some of the virtually unchanged views that once inspired the artist. The trail passes through the historic city centre – past the university’s main building, where the drawing instructor Johann Gottfried Quistorp taught Friedrich and instilled in him a great admiration for the beauty of the region’s landscape – and continues down to the city harbour, today a museum harbour with more than 40 traditional ships, evoking the era of great sailing ships. The Trail then heads out to the Bay of Greifswald and on to the ruins of Eldena Abbey. The former Cistercian monastery was rendered world-famous and became an icon of Romanticism because of Friedrich’s paintings. In time for its 800th anniversary, the site underwent extensive rehabilitation. Particularly in summer, the ruins make an impressive backdrop for theatre performances and concerts but also for visual and performing arts experiments. The trail starts in Lange Straße No.57, the painter’s place of birth. The building today houses the Caspar David Friedrich Centre and the offices of the Caspar David Friedrich Society. The centre offers visitors from all over the world the opportunity to explore the great Romantic painter’s family, his life and work in a variety of ways. The soap and candle works, founded by Friedrich Senior, also form part of the exhibition. The trail includes St. Nicholas’ Cathedral, where the painter was baptised, the University of Greifswald and St. Jacob’s Church. It continues along the city’s ramparts along the river Ryck to the ruins of Eldena Abbey. Visitors can also take in the world-famous view of the Greifswald cityscape with its three Brick Gothic churches, immortalised by Friedrich’s painting ‘Meadows near Greifswald’ (1820-22, Hamburg Kunsthalle). The trail finally ends at the Pomeranian State Museum in the city centre, where visitors can admire some of the painter’s original works as part of a large collection. Visitors can walk or cycle along the trail, with or without a guide. 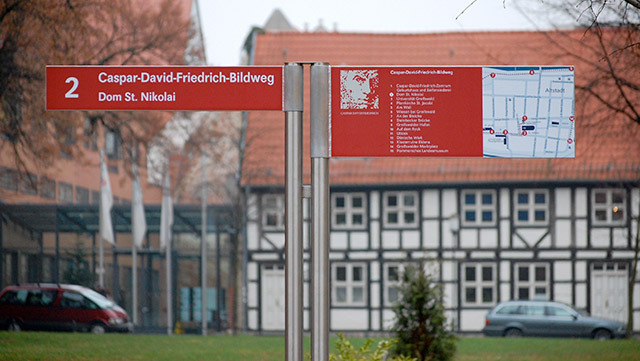 The Caspar David Friedrich Centre offers guided tours of the trail. Alternatively, visitors wishing to explore the trail on their own may find the leaflet ‘Following in Friedrich’s footsteps in Greifswald’, a short description of the fifteen stops and of three different routes along the trail, or a longer text version (brochure), useful.